* Last year, promising striker Christian Josiah trained with the Flying Eagles, the Nigeria U-20 national football team, and starred for COD United FC, a second level side, during the 2012 FA Cup. Strangely enough, I can not document that Josiah played any league matches for COD United FC during the Nigeria National League 2012. Apparently, there were some issues with his registration. Before the Nigeria Professional Football League 2013, Josiah joined top level side Sunshine Stars FC. Josiah has made a wonderful start at the Akure-based club. After four rounds, Josiah has played four matches and scored one goal, against Kwara United FC on 20.03.2013. Josiah is definitely a player to watch in the continuance. * Last season, Rising Stars FC of Akure was relegated from the Nigeria Premier League. Akure rivals Sunshine Stars FC has signed some of the best players from the team, including centre-back Henry Ezekiel, who trained with the Nigeria B national football team in August 2012, top scorer Yahaya Adamu (born 17.07.1993) who scored six league goals and played several matches for the Flying Eagles, and winger Francis Shedrack, who scored three league goals. * Alaba Osawe (born 05.09.1989) is a brilliant centre-back at Sunshine Stars FC. Osawe, who has started all four matches so far this season, has been described as a lanky defender who is “strong in the tackle” and “skilful”. The picture is of Osawe and was found on MTN Football. * Defensive midfielder Dare Ojo was a key player for Rising Stars FC during their 2012 campaign. Ojo is currently playing for Kwara United FC and is getting rave reviews for his five-star performances, balancing the team with his clever passing, ball-winning ability and energetic style of play. Ojo scored one goal during the Nigeria Premier League 2012. * Watch out for Baker Ebiabowei, the centre-back of Nembe City FC. Ebiabowei, who played for Bayelsa United FC during the Nigeria Premier League 2009-2010, trained with the Flying Eagles in April 2012. He has made some impressive performances for the newly promoted side during his return to top-level football. * Despite being early in the season, right-back / right-winger Brown Braye of Nembe City FC has already showed that he is more than good enough for top level football in Nigeria. Braye was part of the Flying Eagles during 2012. * Bolaji Simon Sakin, primarily a striker, has left Kwara United FC and joined Wikki Tourists FC. In April 2012, Sakin trained with the Flying Eagles. On 27.03.2013, Sakin scored his first goal from the Bauchi-based side. * Winger Okiki Afolabi of Shooting Stars FC is getting rave reviews at the moment. Afolabi is a skilful player known for pace, dribbling ability and pin-point crosses. In October 2011, Afolabi trained with the Nigeria U-23 national football team. * I am becoming more and more sure that centre-back Samuel Olabisi of Shooting Stars FC is a player with a bright future. The youngster, formerly of the Westerlo Academy, has been ever present so far this season. * Nnamdi Anyasodo of Rangers International FC is a player that rarely gets the attention he deserves. The talented left-back is a consistent performer who is about to develop into a quality player. Anyasodo has been ever present so far this season. * Stephen Eze of Lobi Stars FC has been a revelation so far this season. Eze is a young centre-back who was promoted from the youth team of the Makurdi-based side before the season. 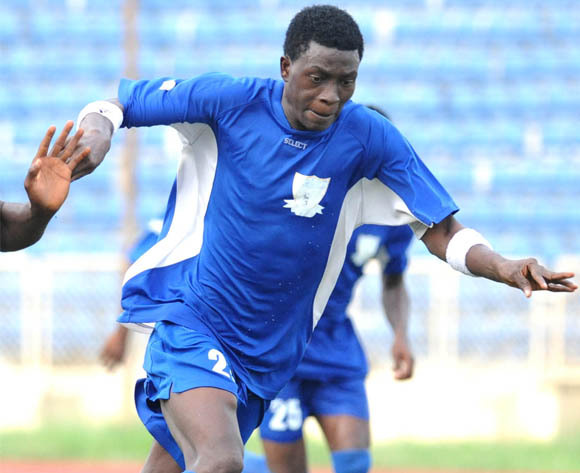 * On 28.03.2013, towering striker Ukeyima Akombo (born 25.11.1987) scored his first goal for new club Enyimba FC. Last season, Akombo scored two goals for Sunshine Stars FC. * Experienced striker Haruna Babalo is now playing for El-Kanemi Warriors FC. Babalo seems to score goals wherever he plays and the journeyman has now featured for at least five different clubs since the Nigeria Premier League 2009-2010; Gombe United FC, Niger Tornadoes FC, Wikki Tourists FC, Akwa United FC and El-Kanemi Warriors FC. Babalo, who can also play at centre-back, scored his first goal for El-Kanemi Warriors FC on 28.03.2013. * Chidiebere Okoli (born 05.05.1988) left Sharks FC to join rivals Dolphins FC before the current season. Okoli has already made the left-back position his own at his new club.